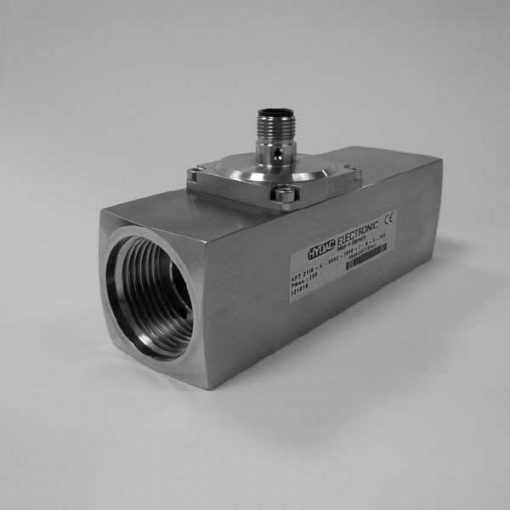 To begin with, the HFT 2100 series of HYDAC flow transmitters is based on the variable area float principle. In addition, irrespective of the installation position, the test medium deflects a spring-loaded float in the direction of flow, depending on the flow rate. Moreover, a Hall sensor which detects the position of the float is fitted to the outside of the instrument and is, therefore, separate to the flow circuit. In proportion to the deflection of the float, the sensor produces an analogue signal which corresponds to the particular measuring range. Furthermore, the calibration of the device is for vertical installation and for an upward flow direction. What’s more, the design of the transmitter gives reliable measurements within its accuracy range, even with changes in viscosity. Therefore, the kinematic viscosity may vary between 30 and 600 cSt.